Picture Proverbs Volume 2 is the book of Proverbs chapters 17 - 31 plus Psalm 23, I Corinthians 13 and an 8-minute presentation of the Life of Christ. Over 1,000 pictures are used to communicate the meaning of the verses, along with over 650 different Bible story pictures including both well-known and little-known Bible stories. *A suggestion for pastors is to play the 8-minute presentation of the Life of Christ during or at the end of the taking of the Lord's Supper. 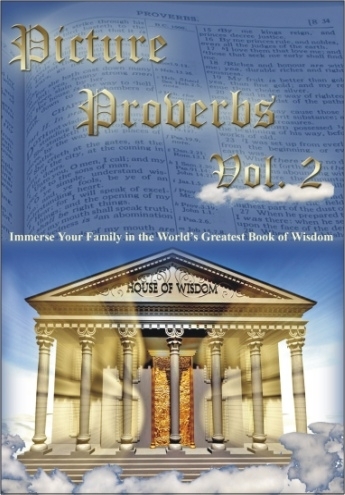 The opening sequence of Picture Proverbs Volume 2 takes you into Heaven itself! This introductory sequence may be the first attempt at a Biblically accurate 3D animated sequence of Heaven. 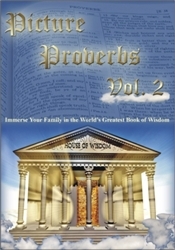 Picture Proverbs Volume 2 is available in our Picture Proverbs Deluxe Set at a discounted price.